I spotted these in the Daily Candy London edition today and had to share because I think it's the neatest strangest most odd yet somehow interesting thing ever. Want to work at home but feel the need to break away from the family and the overall home environment? Find that working from home often involves folding the laundry while on a conference call? Maybe you need a home away from home with a Sanctuary Garden Office. True, you could just go to the office, but why bother when you can hang out in your adult play house, aka the sweet little shed in the backyard. No chores to distract you, no television talk shows to interrupt your thoughts, and no more nosey co-workers popping their ugly heads over your cubicle. The best of both worlds, sort of in between. 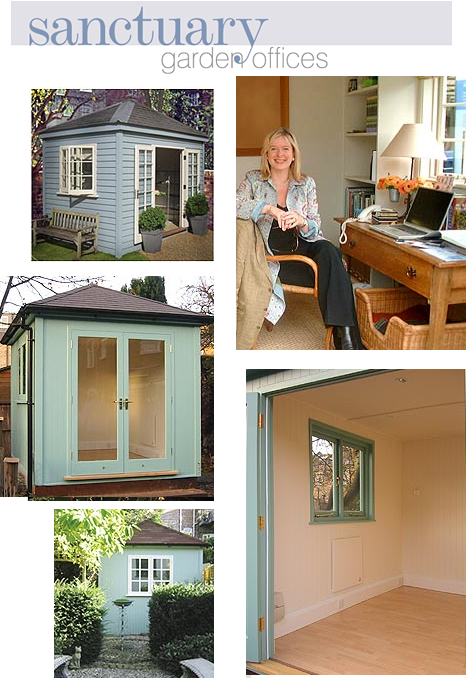 For a mere 15,000 british pounds (around 28,000 USD) a chic shed can be all yours. Constructed of natural materials and finishes according to specifications, not to mention fully insulated, you may never surface again.